How To Reverse The Damage From Cell Phone Radiation, Hidden Sources Of EMF, The Best Way To Measure Your EMF Exposure & Much More With Dr. Joseph Mercola! My guest on this show first appeared on the very popular episode: “Killing Fat Cells, Fixing Mitochondria, Growing Superfoods & More: The Official, Much-Anticipated, Mind-Blowing, Geeked-Out Podcast” and then again on the equally popular episode “High-Fat Fudge Balls, The Best Fruits For Blood Sugar, Egg Allergies & More With “Fat For Fuel”. 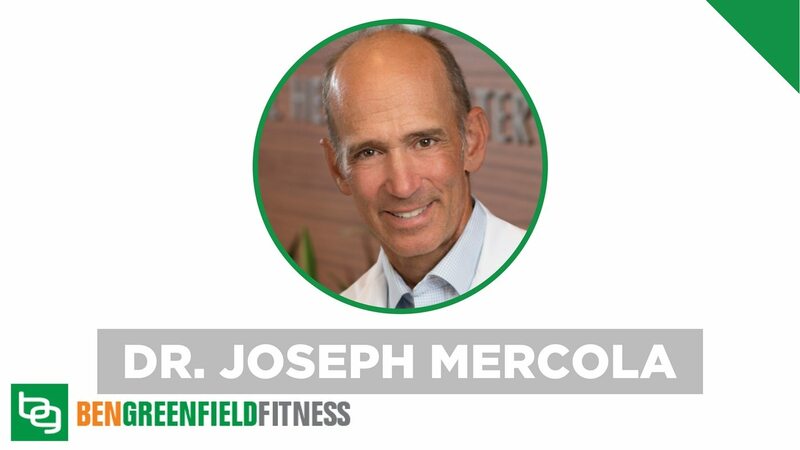 If you hadn't yet guessed, his name is Dr. Joseph Mercola, and – in addition to being an outside-the-box, cutting-edge thought leader on everything from cancer to fat loss – he also happens to be living in the trenches when it comes to protecting yourself against and mitigating the damages from non-native, harmful electromagnetic fields, “EMF”. -eHarmony – Come see how eHarmony can change your life. Go to eHarmony.com and get started. Enter my code GREEN at checkout to get a FREE month with every 3-month subscription. -GAINSWave – To learn more go to GAINSWave.com/Ben and find a provider near you. Don’t forget to mention you heard about GAINSWave through Ben Greenfield and you'll get 30% off your FIRST treatment. Do you have questions, thoughts or feedback for Dr. Mercola or me? Leave your comments below and one of us will reply! I really appreciate Dr. Mercola. As a health coach who works with people with electro-hypersensitivity, I really appreciate this interview and the fact that this critical issues is finally being addressed by top complementary docs. Thank YOU, Ben! The nutritional and supplement recommendations are great as well as fasting suggestions to eliminate damaged cells. I am familiar with many products on the market and have never seen better results than with the comprehensive, 3 – pillared solution which uses patented And proprietary products offered by GIA Wellness. This is because these products directly addresses the EMF at its source – cell phone, computer, wifi routers, smart meters, and more, while bolstering your body’s defenses and restoring critical cellular function that is badly compromised by EMF exposure. You can go here for a helpful Wireless Lifestyle Survey: https://mailchi.mp/b7b17262d3a7/lifestyleassessment or www.LiveGIA.com. GIA wellness has the license to Dr Igor Smirnov’s MRET technology (as recommended also in The Truth About Cancer), which literally stops the body’s many stress responses to EMF (as well as Energy resonance Technology (ERT), which strengthens your body’s energy system in the presence of the EMF toxin. I love using these because they address everything Dr. Mercola and other EMF educators speak about – mitochondrial dysfunction, autophagy, apoptosis, cellular absorption, limited detox pathways, VGCC issues, inhibited production of cell energy, inability of cells to repair, bioaccumulating toxins, heavy metal accumulation, everything from brain fog to anxiety, arrhythmia, etc. I can also share with you a fabulous study summary done by Dr. George Carlo & Tamara Mariea using these products with kids on the autism spectrum and the remarkable results they had.. or go here http://www.danmurphydc.com/wordpress/wp-content/uploads/archive/2008/Article_49-08.mariea.pdf (all the GIA products, including the energized, structured nutrition in the GIA products were used to produce these results and clearance of heavy metals reported. Working with clients and individuals for over 10 years has been wonderful as I help individuals address the stress responses to EMF that wreak havoc on our sensitive bodies. GIA uses a fundamental, 3-pillared approach: EMF products like Pendants, Cell and Universal Guards, Smart Meter Defender, Home Harmonizer, The Smart Card, that literally STOP your body’s many stress responses to EMF, secondly, optimizing Hydration & Detoxification, so impaired by EMF exposure, by using properly aligned, SFA/MRET) energized water called iH20/MRET water, and, third, using single file aligned, structured and energized non gmo, pesticide/herbicide free, gluten free, no soy, no dairy potentized nutrition. GIA is doing a stunning promo for January 2019. Please reach out to me if you would like help navigating your journey. This is my journey and purpose to fulfill as well. https://mailchi.mp/b7b17262d3a7/lifestyleassessment or www.LiveGIA.com. Unclear on Solar Inverter remediation. The linked paper describes LC and Shunt filtering and is rather complex. Can you please point us toward the Capacitor solution Dr. Mercola recommended? I’d very much appreciate link. Thank you. Those RJL BIA machines are expensive. Anywhere they can be rented? Is Dr. Mercola an osteopathic doctor? Is this the same guy who was punished by the FDA and FTC for selling tanning beds that he claimed would prevent cancer? I listened to your podcast and am now reading “If our bodies could talk” by James Hamblin and if this is the same guy he is a scam artist (pages 83-84). Doesn’t believe in vaccinations and was caught selling illegally marketed substances in 2006. I hope it’s not because you gotta vet these guys better if it is. Thanks. Sigh, this has been a long time suspicion of mine and I thank you for bringing EMF up and raising awareness. I have a predicament, I only have 2 USB ports on my MacBook, 1 of which needs to power my Headset. Anyone have any luck finding a keyboard with a USB that your mouse can plug into (so you only require 1 USB port from your computer)? I urge your listeners to look at the evidence objectively and make up their own minds. I understand you are a man of science, and I am genuinely intrigued as to how you would explain the glaring inconsistencies between what Mr Mercola has to say about EMF (and other topics) and the weight of objective scientific opinion. Science is not perfect, but it is the best method we have to evaluate the evidence. I have to say I agree. Dr Mercola has been discredited so many times I find it difficult to understand why he is featured on this podcast. It is one thing to explore alternative approaches that have been systematically studied and have demonstrable efficacy (yoga or the effects of ashwagandha or curcumin, say) but Dr Mercola’s claims seem pseudoscientific and are deliberately designed to mislead people into believing they are evidence based. So I have grounding sheets and the wrist band that I use everyday coupled with a few other ways to minimize my EMF exposure; like orgonite (I’m not sure of the validity of these though I make them with beeswax and its fun! You can see them on my insta @naturalorgonite) And I know that kitchen appliances are a huge source, so going along with Dr. M’s example, could I put a grounding sheet under my refrigerator and have the EMF output drastically lowered? Or like with the electric razor example, not that I use one, but could you make like a mitten out of the material, have it connected to a proper grounding socket and be safe? I’m wondering if this concept will work on basically all electronics??? And also I hope to get your thoughts on the power of crystals protecting against EMFs. Ben: what is your take on low emf infrared saunas? They promote so many health advantages, however, after listening to your podcast and you and Dr. Mercola talking about blow dryers and electric toothbrushes, how could a daily routine of sitting in one of these be healthy? I use a low EMF sauna from Clearlight Saunas. The folks at Clearlight have made it their mission to eliminate EMFs from their saunas, and they've come pretty darn close. You can learn more about that here: https://www.healwithheat.com/low-emf-sauna/ If you're interested in getting one, code: BEN will save you $450. Although it is on airplane mode, i charge my cellphone on my nightstand (and use it for alarm). I also use an oil defuser and white noise machine as sleep aids. Am I better off unplugging and forgoing the benefits of these? I'm not an electrician, but I don't see why not. As long as you're not turning off your refrigerator or anything else important that needs to be on. Wondering if coffee and tea are okay during the multi-day fasts? I would love to start with 5day water fasting, but I’m a little concerned that with doin g this, all sorts of toxins like mercury could be released (and redistribure). Is that something to consider or is this nothing to worry about. If do, whats best to do? From Dr. Mercola: Good point. Detox is definitely going to happen so it is wise to be on binders to catch the toxins. I like to do coffee enemas starting on day 2 once the colon is empty. I personally take chlorella, Biosil, and Cytodetox, but there are many other binders that would work to catch the toxins. I also do far infrared saunas to sweat out the toxins. Would it possible to say which german Company is Dr Mercola referring to as one of the leading manufactures of shielding material (maybe also how to assess such companies) . It is hard to find any valuable information in this field. And there seem to be quiet a lot of businesses which try to make the fast money with fear. does that effect the emf ben ?? From Dr. Mercola: Grounding to earth WITH shielding can be useful to shield electric fields but your question is nebulous. If you just use a grounding pad in an electric field you will make it worse. Mercola mentioned collagen and the amount he takes before a workout. What was that amount? I thought he said 2-3 grams?? I take 2 scoop of Bulletproof collagen at 24 grams. Wondering if that is too much or too little? From Dr. Mercola: I take 3 grams three times a day. There aren’t many branched chain aminos in collagen to stimulate mTOR but I am not a fan of high protein although Mark Sisson takes 20 grams but he is not as concerned about mTOR. Would following Dr. Satchin Panda’s time restricted eating, which is fasting on nothing but water for at least 13 hours every night and making sure to get all your meals in during the day light hours, have the same effect of autophogy? In Dr Satchin Panda’s research he talks about this meathod having that effect I’m just curious if it’s as effective as fasting for multiple days. This would have a profound effect on cellular autophagy yes. Dr. Mercola notes phase angle ranges for optimal health. It’s helpful to hear his reference ranges, but I use the RJL BIA machine at work and PhA is reported as 5.2, 8.4, etc…. nothing close to 60 (or even 35, which he states is pretty much being dead). Is there a conversion that needs to be done? Interesting, I'll take a look. Thanks! Ben, do you have a penchant for quacks and con artists, or are you sincere and just being duped by this guy ? Your guest is basicaly the laughing stock of the science community. I think this is an important point to bring up. Ben is incredibly sincere. He casts a wide net. Some of that certainly includes controversial claims. I would like to see balanced treatment a bit more. Some guests could debate each other. Those counterpoints would help immensely. If it’s all in the name of science, we need to see more sources cites, more studies quoted, and just more evidence overall. Did you really just try to justify your comment with a Wikipedia article that was mostly referenced by opinionated articles from a non scientific community and a site called Quackwatch? If you think the wikipedia article is not a reflection of the truth please go there and propose some edits and see if it reaches a consensus. It’s just the most unbiased source of information I could find. What’s wrong with quackwatch btw ? As great as Wikipedia is, you still have to be very careful and aware of the fact that strong biasis could be at play. All it takes to make a Wikipedia article (speaking from experience) is a well written article with a sufficient amount of references. For all we know this article could have been written by a contributor of Quackwatch (or any one of those websites referenced) for SEO purposes. Not all Wikipedia articles are written for the right intentions. Many are written for a specific purpose. Whether Dr Mercola is a quack or a genius, truth is not achieved through consensus. Ever. Science either is. Or it is not. There is no room for consensus. If the extent of your due dilligence is a wikipedia page, well then you make me laugh. Best of luck with your health, and by all means see your doctor ASAP. I am sure he has a variety shots and perscriptions that can solve any issues you may face. I always learn so much when you and Dr Mercola talk. My most interesting take away is the EMF’s coming from my electric toothbrush. I never even thought of that. Thank you. Is that the same for the Quip toothbrush that you promote Ben? I have never measured the amount of EMFs coming off of the toothbrush. Thank you for bringing this to our attention. It's been updated. my grandfathers name is Ivo. Don’t see that much.